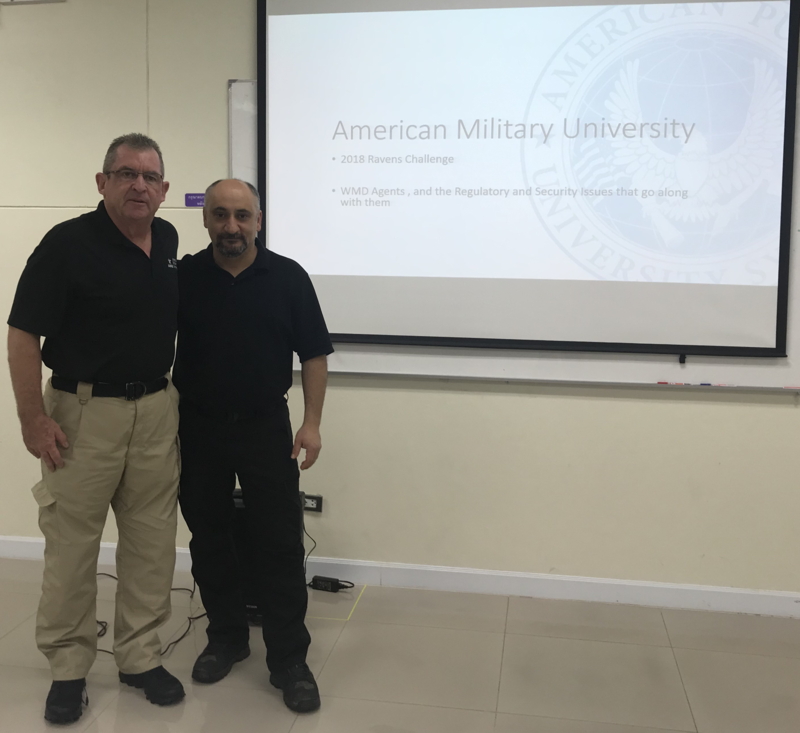 It is a pleasure again to work alongside the American Military University (AMU) Cadre/Faculty in support of Ravens Challenge 2018 ASEAN. MIKE BUSSELL, the newest member of the team, gave three days of classes to the Royal Thai Police units to include the Border Patrol, 191 Unit, Metropolitan Police, Immigration Police, and MRTA Explosive Ordinance and Disposal (EOD), Singapore Army EOD, Hellenic Air Force EOD and supporting members in preparation for the operational and field training evaluation week in HUA HIN. The classes consisted of AMU conducting there higher educational track classes with Electronics & Explosives, Chemistry & Explosives, and Weapons of Mass Destruction. 30 international students earned 50 CEUs that are transferable back into AMU. Mike Bussel is the primary instructor for AMU school’s Explosive Ordnance Courses and is one of the primary instructors in the school’s Transportation Security Administration (TSA) education program. Mike Bussell joined TSA on August 29, 2010, as a Transportation Security Specialist Explosives (TSS-E). During this time, he also served a ten-month long assignment as the Explosive Specialist on the Northwest Region VIPR Team assigned to the Federal Air Marshals for that time. Before his time with TSA, Mr. Bussell worked for The United States Department of State, where he was an Instructor for the Explosive Incident Countermeasures Course (EIC) that trained Foreign Bomb Technicians.